For the last 10 years I've been drinking coffee at the same cafe in the middle the old quarter. It sounds like I'm a creature of habit but I love the coffee here, the people and the customers. I meet other regular customers all the time and sometimes we have a chat. Sometimes they help me to buy produce from the travelling vendors such as flowers, food, meat or sometimes order my lunch. I would say Cafe Nang, 6 Hang Bac street is one of the oldest cafe in town and is busy for most of the opening time. The owner is an old lady with a very sweet smile who wakes up everyday at about 3am to prepare the coffee before walking around Hoan Kiem lake for exercise before heading up to her favorite Pho shop for breakfast. She gets back to her shop (the house is upstairs)and returns to sleep until 12 or 1 pm. Then she goes down to help her daughter to run the cafe. She makes the best coffee, even better than her daughter. The cafe also serves seasonal juices as well, passion fruit juice being my favorite and the staff know that I like to drink it with the seeds while other customers don't. The cafe's staff changes sometimes but they do remember the customers' choices very well and for me, it's white coffee with lots of condensed milk. Whenever I sit down, my coffee is put on my table instantly and tastes perfect every time. Can't complain at all!!!! While there are an increasing number of cafes around the old quarter, it doesn't seem to impact on her business. The reputation of Cafe Nang is obviously strong. Customers sit on low wooden chairs at low wooden tables and in the peak times, people have to sit on the other side of the road but nobody seems to worry about that. They come to Cafe Nang to enjoy the coffee and the great atmosphere. observing the tourists walking by. It's probably the best place for people watching in Hanoi. 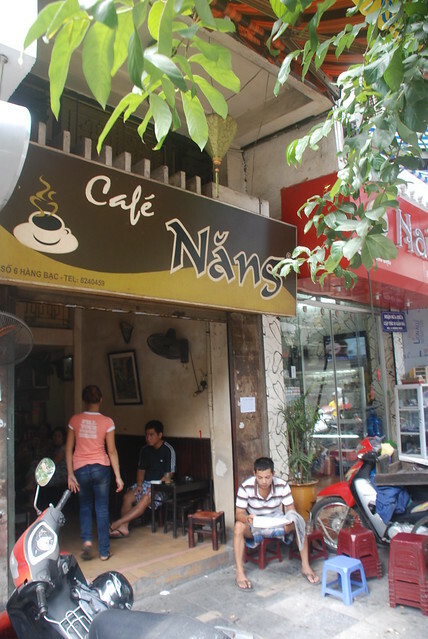 There have been quite a lot of famous publications that have visited Hanoi and Cafe Nang is often part of their story. I'm sometimes involved in their stories as an interpreter to help the journalists to understand a bit more about the cafe and its proprietor's life. She took over from her father in law after he died and has been running the original Cafe Nang for just over 60 years. She buys her own coffee from the centre of Vietnam, stores it on the forth floor and roasts it herself twice a week. When the coffee is roasting, the area surrounding the cafe is full of the aroma of coffee. She told me she gets a lot of satisfaction from making coffee but she just cant do it all the time as she's getting old. She has transferred her experience to her children and they have since opened two other Cafe Nangs in town but they aren't as popular as the original. 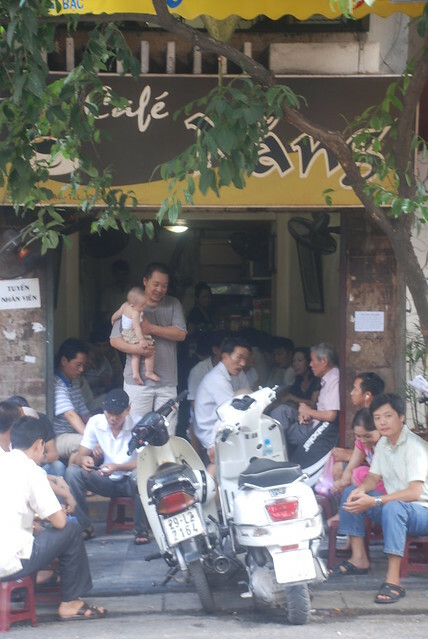 If you are visiting Hanoi, come and enjoy the great coffee here. The price is the same for both tourists and locals. There is no need to worry about being ripped off here at Cafe Nang. For a good coffee every time, you can't beat Cafe Nang. 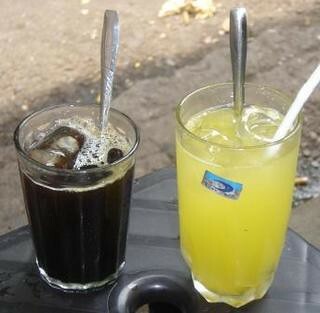 Cafe Nang la mot trong nhung cafe cu Nhat o Hanoi. Minh cung thuong uong o day va co thay Cau o day. Khong ngo cau la nguoi viet blog nay. Rat nguong mo cau. Hinh Anh rat dep va an tuong. Thank you for posting this! Heading to Hanoi next month to play 'tourist' and deep in assembling the list of local places to try. This looks like a must do! I love vietnamese coffee. Its very strong and taste beautifully. I think i went to this cafe 2 years ago in my first trip and it was so crowded but people was very friendly. is this cafe near Be market? I +also have the same customs you have, because I use to go to the Bull head cafe, that's perfect because I know the same people, the same conversations and you know what I like it because I love gossips.